IPO CORPORATE GOVERNANCE Richard B. Alsop and Rupa R. Briggs Shearman & Sterling LLP 50 | IPO Corporate Governance IPO CORPORATE GOVERNANCE Richard B. Alsop and Rupa R. Briggs Over the past two years, we have examined the impact of the new voting policy initiated by ISS Governance (ISS) in 2016 on the corporate governance practices of newly public companies. 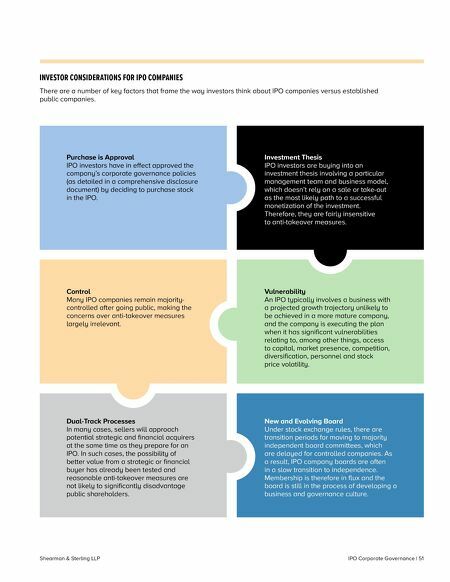 The voting policy recommends a vote against directors of newly public companies due to the adoption, prior to or in connection with an IPO, of corporate governance policies that adversely impact shareholder rights. ISS updated the policy in 2017 to expand the adverse vote recommendation to directors of IPO companies with a multi-class capital structure with unequal voting rights. ISS also removed as a positive factor in the policy the public commitment by the company to have a shareholder vote on the provision within three years of its IPO. In its place, ISS included a more stringent requirement of a reasonable sunset provision with the intention of ensuring that THE ISS POLICY The ISS voting policy states that for newly public companies, ISS will generally vote against or withhold votes from individual directors, committee members or the entire board (except new nominees, who are considered on a case-by-case basis) if, prior to or in connection with the company's IPO, the company or its board adopted by-law or charter provisions materially adverse to shareholder rights, or implemented a multi-class capital structure in which the classes have unequal voting rights. ISS considers the following factors when making its voting recommendation: the adverse practice is eventually eliminated. 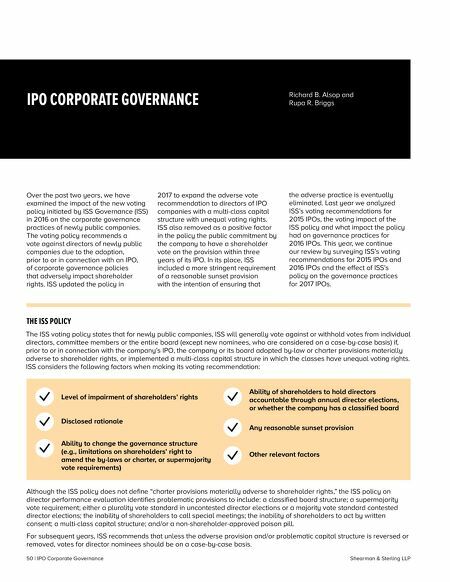 Last year we analyzed ISS's voting recommendations for 2015 IPOs, the voting impact of the ISS policy and what impact the policy had on governance practices for 2016 IPOs. This year, we continue our review by surveying ISS's voting recommendations for 2015 IPOs and 2016 IPOs and the effect of ISS's policy on the governance practices for 2017 IPOs. Level of impairment of shareholders' rights Ability of shareholders to hold directors accountable through annual director elections, or whether the company has a classified board Disclosed rationale Any reasonable sunset provision Ability to change the governance structure (e.g., limitations on shareholders' right to amend the by-laws or charter, or supermajority vote requirements) Other relevant factors Although the ISS policy does not define "charter provisions materially adverse to shareholder rights," the ISS policy on director performance evaluation identifies problematic provisions to include: a classified board structure; a supermajority vote requirement; either a plurality vote standard in uncontested director elections or a majority vote standard contested director elections; the inability of shareholders to call special meetings; the inability of shareholders to act by written consent; a multi-class capital structure; and/or a non-shareholder-approved poison pill. For subsequent years, ISS recommends that unless the adverse provision and/or problematic capital structure is reversed or removed, votes for director nominees should be on a case-by-case basis. Shareholder Activism: Will 2018 be A Record-Breaking Year for Activism? Shareholder Proposals 2018 - Was 14I Really a Game Changer?